WASHINGTON — President Trump’s Supreme Court nominee is a constitutional originalist who opposes all forms of assisted suicide and ruled twice against the Affordable Care Act’s contraception mandate but has never ruled on abortion. The 49-year-old Gorsuch holds a Harvard law degree and a PhD in legal philosophy from Oxford. In 2009, he authored “The Future of Assisted Suicide and Euthanasia,” in which he argues against the practice from both a moral and legal standpoint. 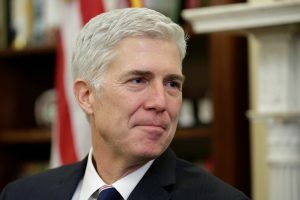 “It is an argument premised on the idea that all human beings are intrinsically valuable and the intentional taking of human life by private persons is always wrong,” Gorsuch wrote in the opening pages of the book. Federal rulings on physician-assisted suicide have been limited. Most recently, a 2006 Supreme Court ruling continued to defer to the states on the matter. In 2009, the Montana Supreme Court ruled against prosecuting doctors who provide aid in dying but made no ruling on the broader legality. But its opponents are still hankering for a fight: In a November op-ed, Wisconsin’s deputy solicitor general urged another legal battle over the issue and a change in conservative legal tactics. In Hobby Lobby’s lawsuit challenging the Affordable Care Act’s contraception mandate, Gorsuch sided with the company in an initial circuit court ruling in 2013 as it sought a religious exemption to the mandate. The ensuing Supreme Court decision allowed privately owned for-profit companies to claim a religious objection to the mandate that they cover contraception for their employees. With Trump’s recent executive order instructing federal agencies to “ease the burdens” of Obamacare, the contraception mandate could once again end up entangled in litigation. On the landmark abortion case Roe v. Wade, however, Gorsuch’s appointment does not move the court in a different direction. Though he has never ruled on abortion before, Gorsuch is expected to vote as the deeply conservative Scalia did should the issue appear again before the justices. The security of the 44-year-old Roe v. Wade ruling is among liberal groups’ chief concerns when it comes to Trump’s judicial nominees. Trump said during the 2016 campaign that he is personally opposed to abortion, and that he would appoint judges who would overturn Roe v. Wade so that states could decide their positions on the issue individually. Senate Republicans now face a procedural decision if Democrats try to block Gorsuch’s confirmation. Senate Majority Leader Mitch McConnell can employ the so-called “nuclear option” — which would allow Trump’s nominee to pass via simple majority rather than the usual 60-vote margin. But McConnell has in the past sounded reluctant to change the chamber’s rules. Many Democrats, incensed that Senate Republicans never gave former Obama Supreme Court nominee Merrick Garland a hearing or vote after his nomination in March 2016, vowed to oppose Trump’s nominee even before Gorsuch was announced. It remains to be seen, however, if enough Democrats will unite to stop his nomination without a change in Senate rules. When President George W. Bush appointed Gorsuch in 2006 to the 10th Circuit Court of Appeals, he was confirmed by the Senate with a voice vote. This article is reproduced with permission from STAT. It was first published on Jan. 31, 2017. Find the original story here.